Robert Laporte designed and built this straw clay Econest in New Mexico. Slip is just clay dissolved in water to a paint-like consistency. If you coat loose straw with a little bit of clay slip, like dressing a salad, it becomes sticky enough to hold its form when it dries. Straw clay can be used as an insulating infill in any kind of wood-framed wall, such as a timber frame or a conventional stud frame. There are special framing techniques to maximize the insulation value of the wall while reducing the amount of wood required. I usually pack the mixture between temporary plywood forms that are screwed onto the wall frame, then removed to let the straw clay dry. When dry, the wall can be coated with clay plaster inside and out to make a breathable, insulating wall. This technique should only be used in dry weather, or under an existing roof, and care needs to be taken with the design to avoid water infiltration into the wall, or severe mold problems may result. The density of a slipstraw wall can vary a lot depending on your recipe proportions and installation technique. The lightest mixes have an R-value comparable to straw bales, between R-1.5 to R-2 per inch of thickness. 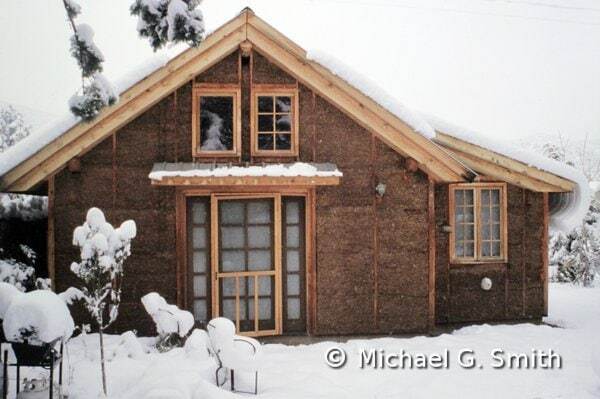 That makes straw clay appropriate as exterior walls for homes in almost every climate. Exterior walls are generally between 8” and 12” thick, but interior partitions can be as thin as 2”.